The St. Peter's Churchyard is a green oasis in the Society Hill neighborhood of Philadelphia. 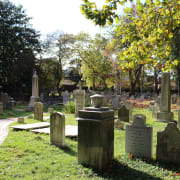 It is the burial ground for many notable Philadelphians, and today is enjoyed by the entire community for its beautiful scenery, trees, flowers, and history. Volunteers gather from March through November on the second weekend of each month (usually 10 a.m. - Noon on Saturday and 1-3 p.m. on Sunday - please contact us to confirm date and time because our schedule occasionally changes). We work to prune seasonal plants, remove ivy, plant annuals, rake leaves, and other general upkeep of the gardens and grounds. No experience is necessary--our gardening group is a welcoming bunch!